Welcoming new year @iZAP Celebration Part-2 - iZAP: Helps to find scalable solutions of your application. As our last celebration Part-1 in December, this is the one more i.e Part-2 Celebration. 01-Jan-2015, A day shaped by different traditions and customs is celebrated with great enthusiasm all over the world. So how we iZAPPERs can miss this opportunity. We celebrate even smallest accomplishments, as a team. So we found NEW YEAR is another reason to celebrate the day with great fervour and joy. We, at iZAP have always tried to create an aura that is homely as well as encouraging. Coming back to what we did on New Year Eve, like always we all dressed up in our best ethnic apparels. The office was decorated with balloons, lights, sparkling decorative items. After working for half day, it was the time of welcoming New Year. The eve began with Presentation on Team Work presented by me. It was really amazing that taught us to work with team and so many things. Now, its time to have delicious lunch. iZAP team is always ready to capture all special moments and after lunch we clicked various photobombs. One of the highlight of this moment is we took uncountable selfies. Now, this was the time to play games.We conducted some ice-breaking games.We made two teams Team RED and Team White. There were so many team building activities held at iZAP like Balloon Burst, Nose dive with cotton, Spoon Frog, Balance the ball, AID Making etc. It was very unpalatable competition. Everyone tried to defeat the other team. This was so much hilarious moment. All were making of each other. Team leader from Team Red and from Team White Chetan Sharma and Mandeep Sharma respectively lead their teams during games so well. 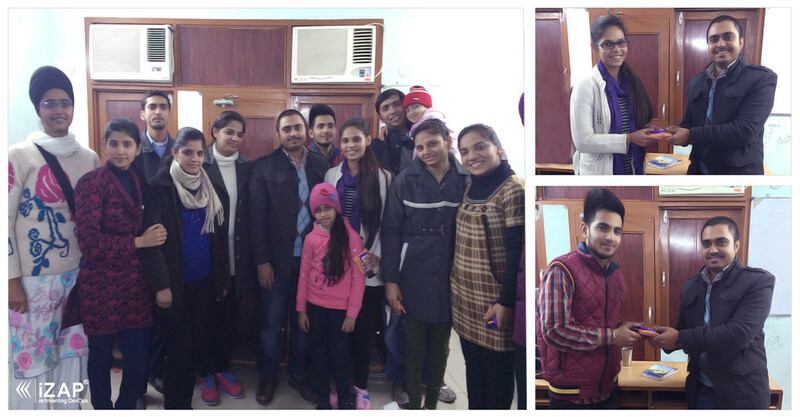 Team Red- Chetan, Dinesh, Monika, Ramandeep Kaur, Shilpi showed their awesome creativity in AID making competition. The highlight of the aid making is Priya’s role. After that, Narinder and Salvi danced so well. After the gaming section all were busy with their talks. Suddenly our CEO Tarun Jangra gave us a wonderful surprise of Jalebizzzz…. After having this meetha, one sweet news came to know that now all are getting a increment. Wow!!! it was like icing on the cake. All were so grateful at that favourable time. We all cherish the moments which we spent and hope that we’ll make 2015 more exciting.